The Gerni Multi II Wet Dry Vacuum Series is incredibly versatile and will clean up mess inside or out. We have a range of high-pressure washers to suit all of your stuff however big, small or dirty it is. See which one’s right for you. Extended warranty now available across all Gerni High Pressure Washers & Wet Dry Vacuums. Click the link below to find out more. Engineered and developed in Denmark, the Gerni Multi II Wet Dry Vacuum is a trade quality machine, ideal for heavier DIY duties around the home. Clean up dirt & debris, soak up water and spills, blow up an air mattress or inflatable pool and even connect power tools to clean up while you work! With its filter cleaning indicator, the Gerni Multi II lets you know when the filter requires to be cleaned or replaced. It also offers a Push&Clean function which is a semi-automatic method of cleaning the filter. This creates an airwave that hits the filter from inside out, which clears built up dust and dirt from around the filter – saving you time, while you work. The Gerni Multi II Wet Dry Series, is the only machine to include a in-built filter guard – protecting the filter from sharp or damaging debris and ensuring longer premium performance. The combination of the filter cleaning indicator, Push&Clean function and filter guard makes this machine truly unique. Together these features ensure you are getting consistent and optimum performance from your Gerni Multi II Wet Dry Vacuum. 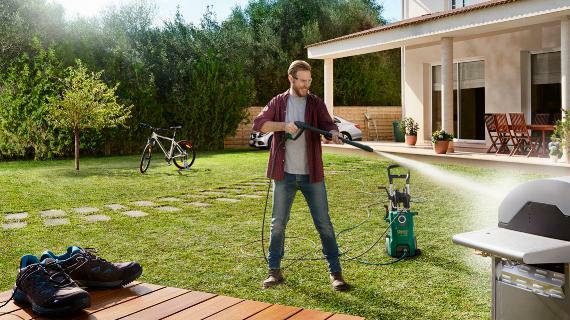 The full and comprehensive range of Gerni high pressure washers means that you’ll always be able to find the right product for your needs. Register your Gerni. Extend your warranty. By registering your Gerni, you will receive an extension on your warranty. Get 5 or 7 years warranty when completing the online registration form and receive an official Gerni warranty certificate. See the Gerni PowerGrip in action in our latest promo film.